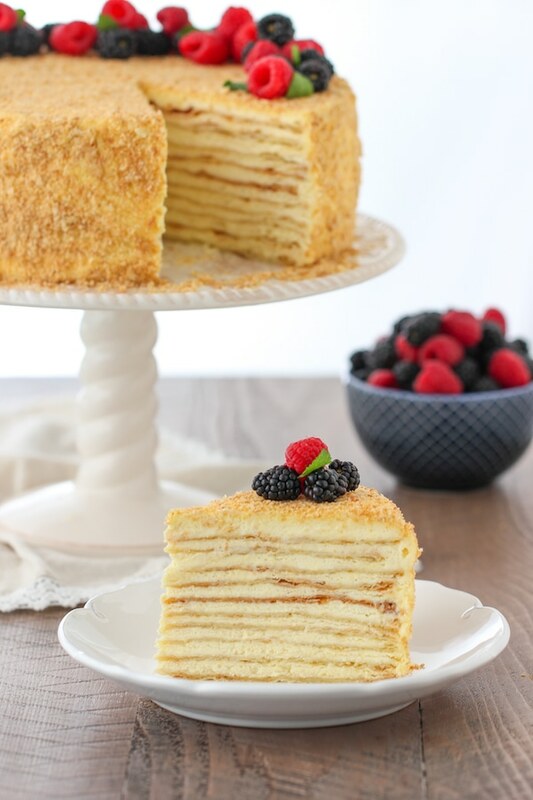 Napoleon Cake is a classic Russian cakes, made of very thin and flaky puff pastry cake layers and a smooth, rich and luscious pastry cream in between the layers. 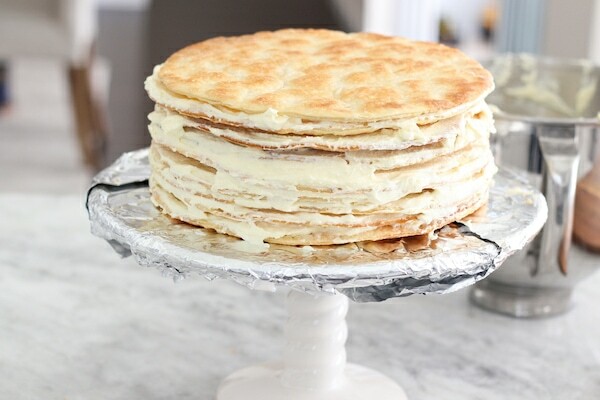 Napoleon Cake is one of my favorite classic Russian cakes. 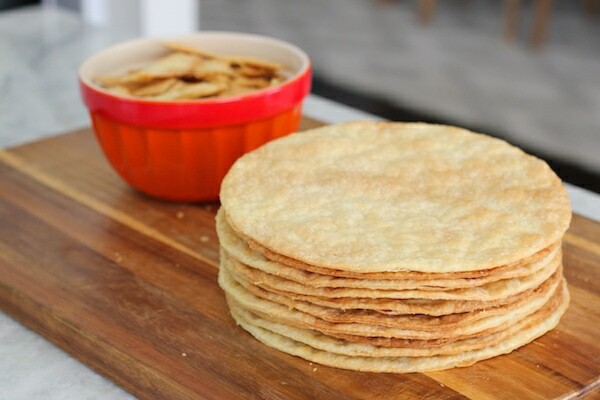 It has a multitude of very thin cake layers that are made from puff pastry dough and are so flaky, puffy and delicate. 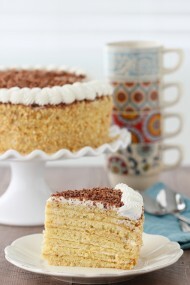 The smooth, rich and luscious pastry cream is such a magical combination with the cake layers. I make my frosting even better with a combination of pastry cream, buttercream and lighten it up with some whipped cream, which makes it so fluffy, luxurious and velvety in texture. It becomes so billowy and soft, almost cloud like. The pastry cream frosting softens the thin, puffy cake layers and they become so tender and the whole cake simply melts in your mouth. The cake needs to stand in the refrigerator for a few hours to soften, as the frosting seeps into the cake. I like to let the cake stand at room temperature for just a bit before serving, and it becomes even softer and gentle in texture. 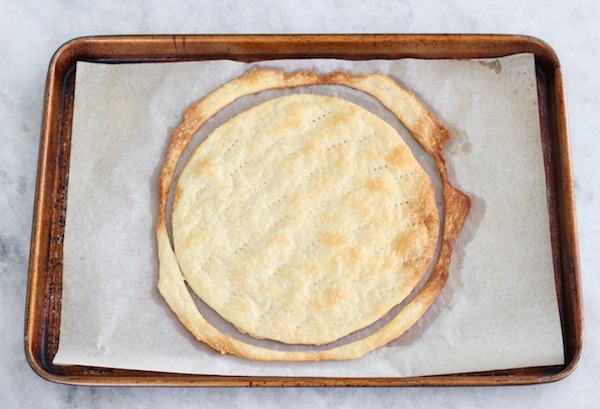 You can most certainly use store bought puff pastry instead of making it from scratch. In that case, roll out the dough to make it thinner before baking. Even though this cake is time consuming, none of the steps are difficult. I break it up into several days, which makes it very doable and not as tedious. If you make the puff pastry dough and the pastry cream in advance, neither take too long to make and it will speed up the process considerably when you are baking the cake layers and assembling the cake. It’s definitely worthy of a special occasion. When making the cake layer dough, I usually do it on the counter, using a plastic pastry mat on top of my counters as a work surface so I don’t damage the counters. Since it’s a large portion of dough (10-12 cake layers), I find it easier to mix it on the counter by hand, using a knife to work the butter into the flour and then adding the liquid ingredients and mixing it by hand very quickly. 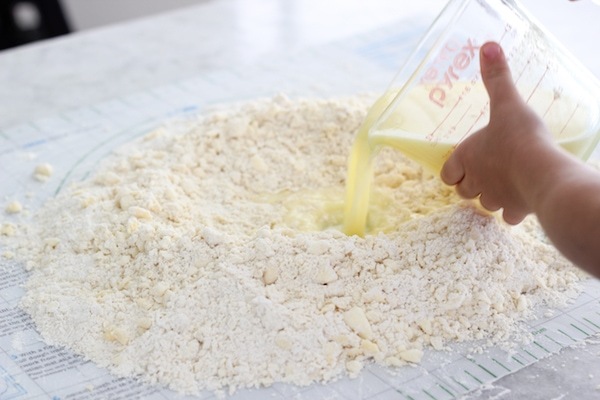 You can also divide the ingredients in half and use a food processor to pulse the butter into the flour, then pour in the liquid ingredients and pulse just enough times for the dough to come together. Both methods are very quick, it usually takes about 5 minutes total. You don’t want to overwork the dough or it won’t be as tender. 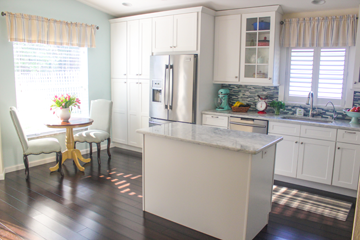 Combine the flour and salt on the counter or food processor. 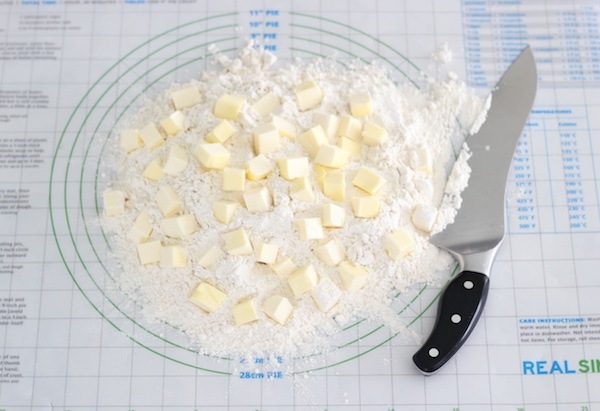 Add the cold butter, cut into chunks, into the flour and use a knife to work it into the flour, until there are pea sized bits of butter throughout the dough. 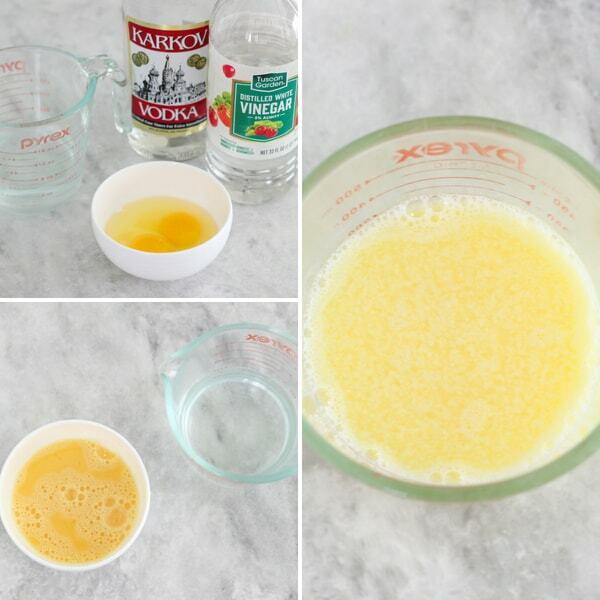 In a medium bowl or large mixing cup, whisk the water, vinegar, vodka, and beaten eggs until evenly mixed. The vinegar and the vodka help to make the cake layers really tender and flaky. The vodka gives the dough more liquid and makes it easier to work with and roll out, but when the cake layers bake, the vodka will cook out, which makes the cake layers more crisp. You won’t be able to taste the vinegar or vodka in the cake at all. 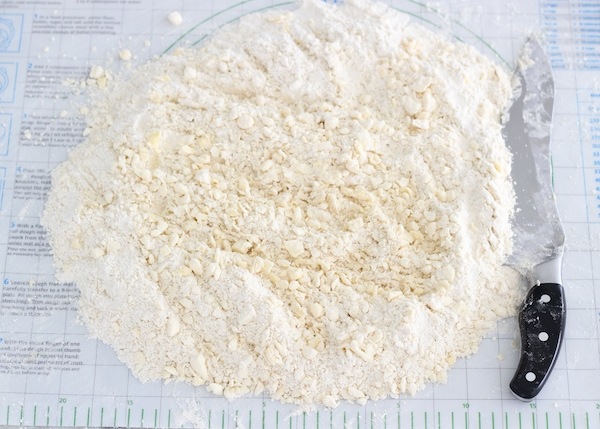 Make a well in the center of the flour on the counter and pour in the liquid ingredients. Gently but quickly mix the dough, just until it comes together. Knead just a little, working the flour into the dough. Work as quickly as you can, so that the chunks of butter don’t completely melt into the dough. 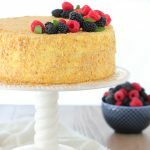 The chunks of butter will melt as the cake layers bake and will form air pockets in the cake layers and give them that wonderful thin, flaky, puffed texture. 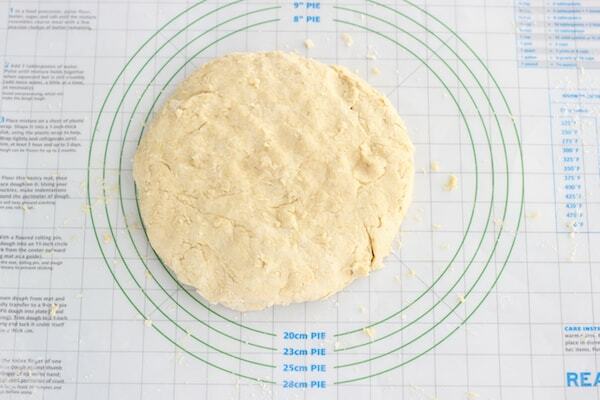 Form the dough into a disc shape. Wrap the dough into parchment paper or aluminum foil and place it into the refrigerator. Chill for a few hours or overnight. Make the pastry cream. Follow the instructions in this post. The recipe is slightly different, but the technique is exactly the same, so use the ingredient amounts from this post, following the instructions in the other post. Chill the pastry cream in the refrigerator until completely cool, a few hours or overnight. I usually make the cake layer dough and the pastry cream the day before I am planning on making the cake. Preheat the oven to 400 degrees Fahrenheit. 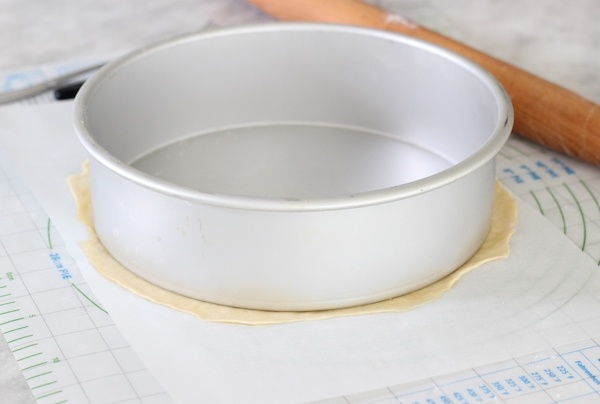 Prepare 2 large rimmed baking sheets, so you can bake the cake layers quicker, if you interchange them, putting one in the oven, rolling out the next layer and then immediately putting it into the oven as soon as the first layer bakes and so on. 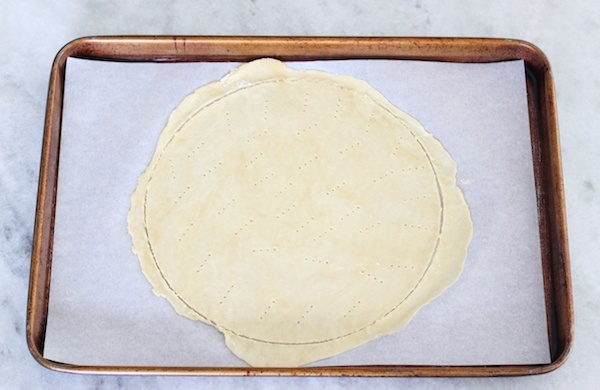 Also prepare 10-12 pieces of parchment paper as big as the baking sheet. Divide the dough into 10-12 layers. If you want an 8-9 inch cake, you will probably end up with 12 cake layers. If you want the cake to be 10 inches, you will have 10 cake layers. Also, I often make 2 smaller, shorter cakes out of this recipe, instead of one large, tall cake. In which case, you will have 2 (8-9 inch) cakes that are 6 layers high, and 2 (10 inch cakes) that are 5 layers high. 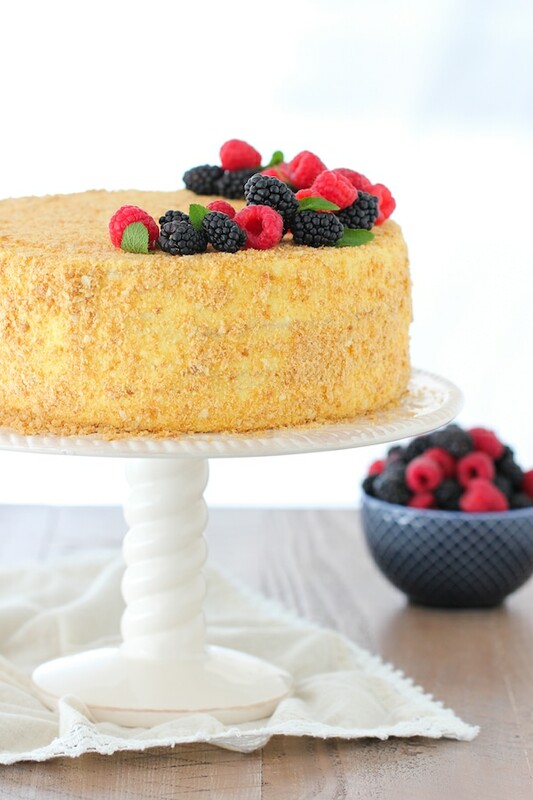 You can easily halve the recipe for this cake. Roll out each portion of cake dough right on top of a piece of parchment paper, sprinkling a bit of flour on it before rolling out the cake layers. Roll out thin circles. Place a 8-10 inch round plate, cake pan, springform pan, etc. on top of the rolled out dough. 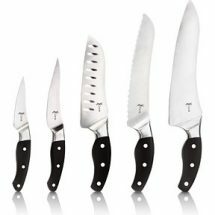 Use a small paring knife to cut out an 8-10 inch circle, all around the outside of the circular object that you are using. Leave the dough remnant just where they are. 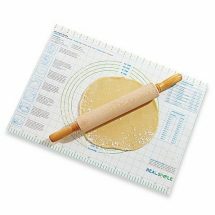 Transfer the rolled out cake layer along with the parchment paper to the prepared baking sheet. 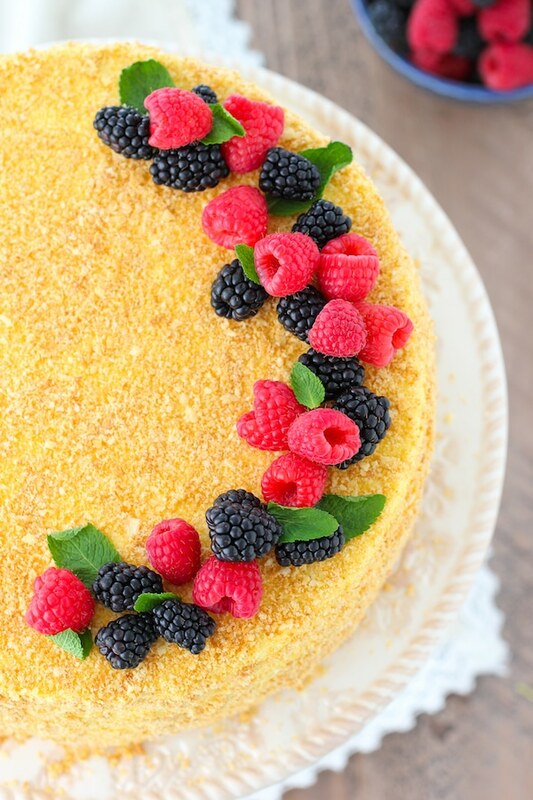 Use a fork to prick some holes all over the center of the cake layers to keep them from puffing up unevenly. Bake in the preheated oven for about 8 minutes, until lightly golden. Repeat will all the cake layers. Set aside to cool. Save the cake dough scraps that baked along with the cake layers. 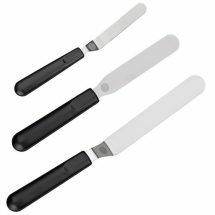 You will use those later as crumbs to decorate the cake. 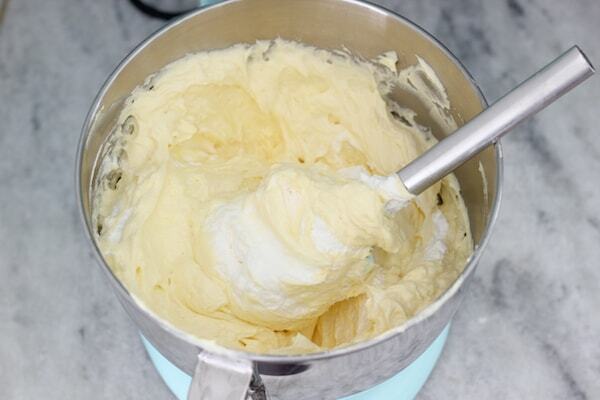 Before you start making the frosting, make sure the pastry cream and the butter are both at room temperature. 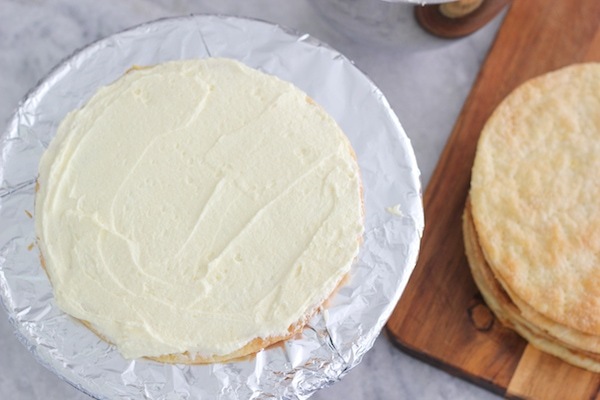 If one or the other is too cold, the frosting will not be smooth and consistent, but will have a curdled appearance, with bits of butter flecks throughout the frosting that you will not be able to fix. 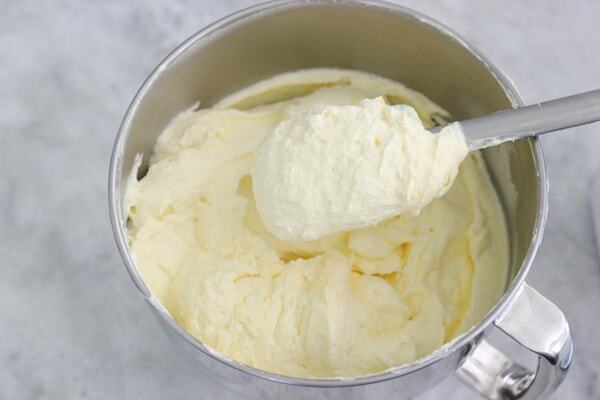 In a large bowl or a standing mixer a using a hand mixer, cream the butter, powdered sugar and vanilla extract, mixing until smooth and fluffy. 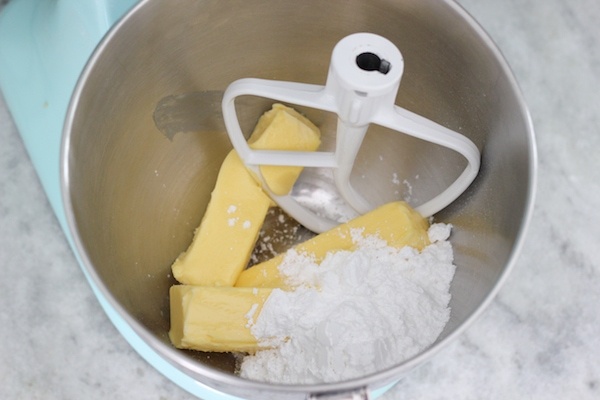 Add the pastry cream, a few heaping Tablespoons at a time, mixing on low speed, gradually increasing to medium speed, until all of the pastry cream is incorporated into the buttercream. 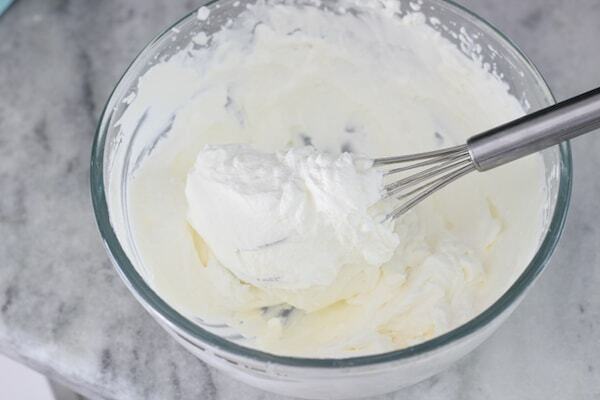 In a separate bowl, whip the heavy cream until soft peaks form. Fold in the whipped cream into the pastry cream. 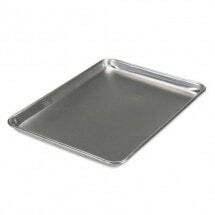 Line your edge of your serving plate/cake stand with aluminum foil. This is a trick I use to keep the edge of the plate clean. Place a dollop of frosting into the center of the plate, just to keep the cake from sliding around. Top each cake layer with a generous amount of frosting and spread it around evenly. You will need to use all of the frosting for the cake, so divide it evenly between all the cake layers. The frosting should be approximately the same thickness as each cake layer. Repeat will all the cake layers and frosting. Smooth out the frosting over the sides and top of the cake. Place the cake layer scraps into a large ziplock bag. 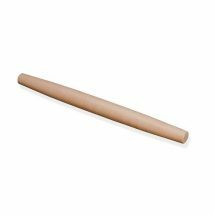 Use your hands or a rolling pin to crush them into fine crumbs. 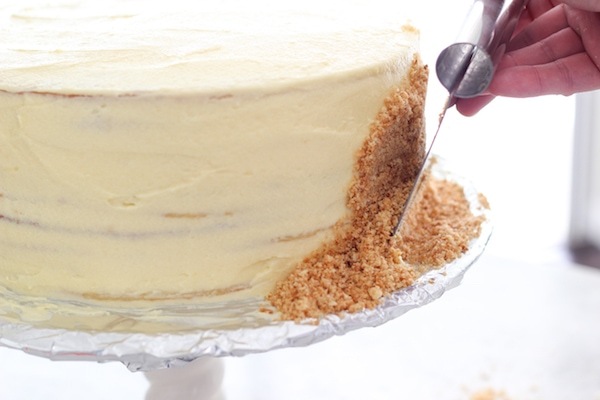 Press the crumbs over the sides of the cake and sprinkle them evenly over the top of the cake. Keep it simple like that, or decorate with fresh berries, chocolate shavings, nuts, etc. Gently pull out the aluminum foil out from underneath the cake. It is best to refrigerate the cake overnight, so that the frosting soaks into the cake layers and gets really soft and tender. It will get slightly shorter as the frosting seeps into the cake layers. Keep the cake refrigerated. 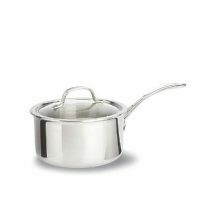 It helps to let it stand a room temperature for 30 minutes or so before serving. Bake in the preheated oven for about 8 minutes, until lightly golden. Repeat will all the cake layers. Set aside to cool. Save the cake dough scraps that baked along with the cake layers. You will use those later as crumbs to decorate the cake. In a large bowl or a standing mixer a using a hand mixer, cream the butter, powdered sugar and vanilla extract, mixing until smooth and fluffy. 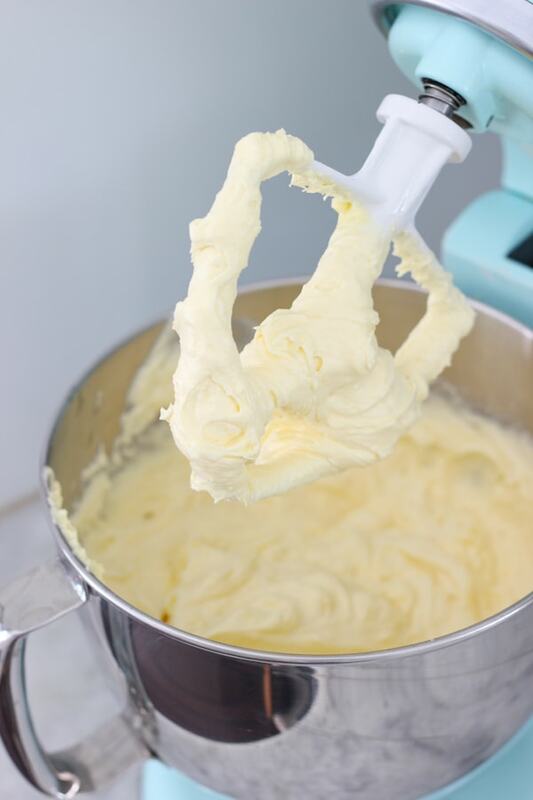 Add the pastry cream, a few heaping Tablespoons at a time, mixing on low speed, gradually increasing to medium speed, until all of the pastry cream is incorporated into the buttercream. Top each cake layer with a generous amount of frosting and spread it around evenly. You will need to use all of the frosting for the cake, so divide it evenly between all the cake layers. 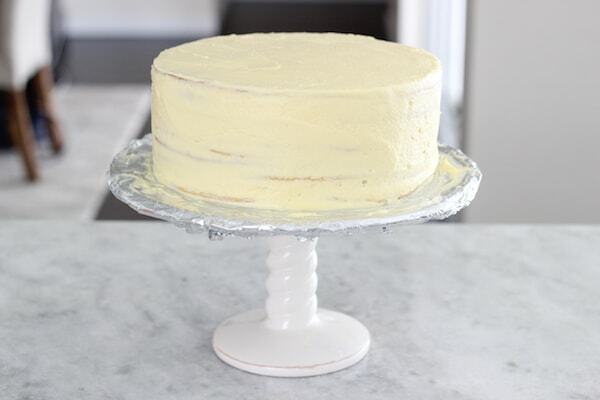 The frosting should be approximately the same thickness as each cake layer. Repeat will all the cake layers and frosting. Smooth out the frosting over the sides and top of the cake. Place the cake layer scraps into a large ziplock bag. 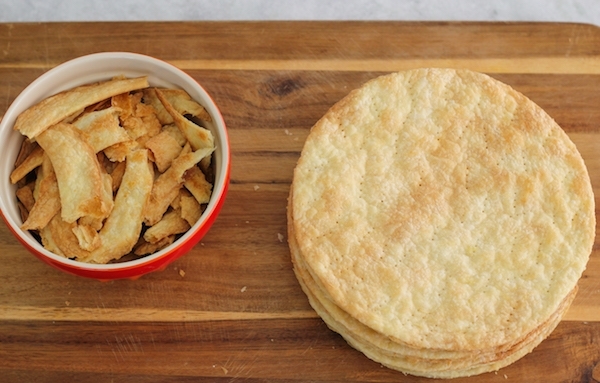 Use your hands or a rolling pin to crush them into fine crumbs. 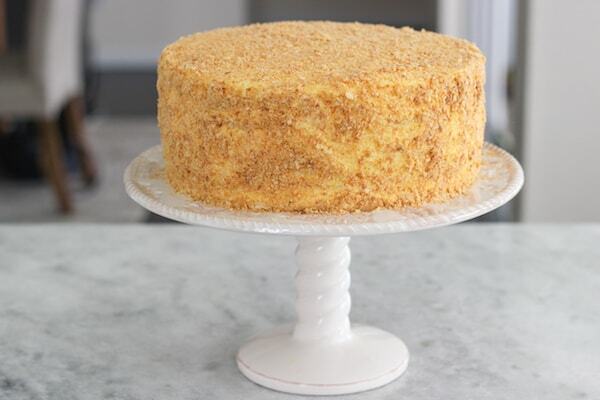 Press the crumbs over the sides of the cake and sprinkle them evenly over the top of the cake. Keep it simple like that, or decorate with fresh berries, chocolate shavings, nuts, etc. Gently pull out the aluminum foil out from underneath the cake. 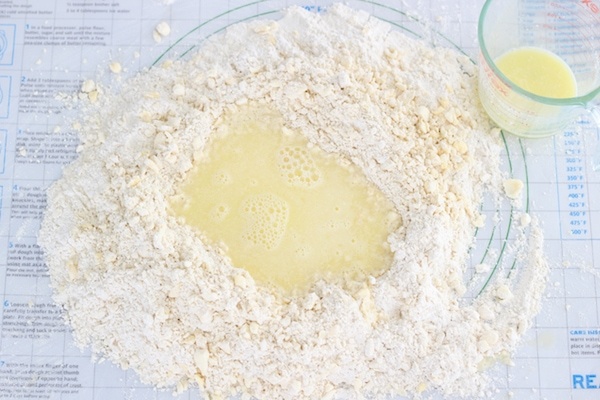 You can also divide the ingredients in half and use a food processor to pulse the butter into the flour, then pour in the liquid ingredients and pulse just enough times for the dough to come together. Both methods are very quick, it usually takes about 5 minutes total. You don’t want to overwork the dough or it won’t be as tender. wow, looks delicious , hard work though !! I save this cake and others like it for special occasions:). Look a amazing! Really wanna try It? Can i substitute vodka for anything? That’s not something I usually buy. They sell tiny little bottles in the liquor store. You can use water instead, but it won’t be as crisp and tender. Looks absolutely amazing! Now I want a slice or two! I love this cake! So much work from scratch!!! I hope you will enjoy the frosting, Anna. It is a lot of work. I save cakes such as this one for special occasions and it’s totally worth it:). Mouth watering! I will have to make this cake for my husband’s birthday. It’s his favorite. Your pictures are amazing. So perfect and colorful. Thank you, Lora! I hope your husband will enjoy the cake on his special day:). Hi Olga! I am about to make the pastry cream and I am a bit lost about ingredients. The posted recipe has different ingredients than the pastry cream here. Do I add butter at the end or not? Use the recipe for the pastry cream posted here, Albina. 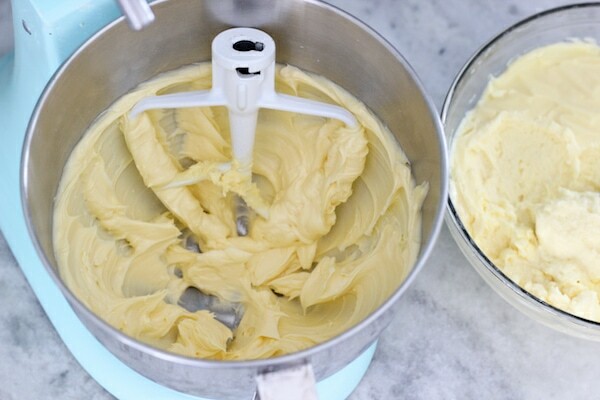 No, you do not need to add any butter at the end, since you will be making a buttercream and mixing the pastry cream with the butter. If using the puff pastry bought from store, would the cream/frosting ingredients portions stay the same? Or should I divide by half ? Your cake looks very tall! and beautiful ! This is a very large cake, 10-12 layers, each one a 10 inch circle. I am not exactly sure how much store bought puff pastry you would need in proportion to the pastry cream, since I usually make the puff pastry dough from scratch. You would need to experiment. Hi Olga! Which is better pastry cream or frosting? I never used the frosting for this cake. I like the combination of pastry cream and frosting, Ekaterina. Thank you Olga! Love your website. 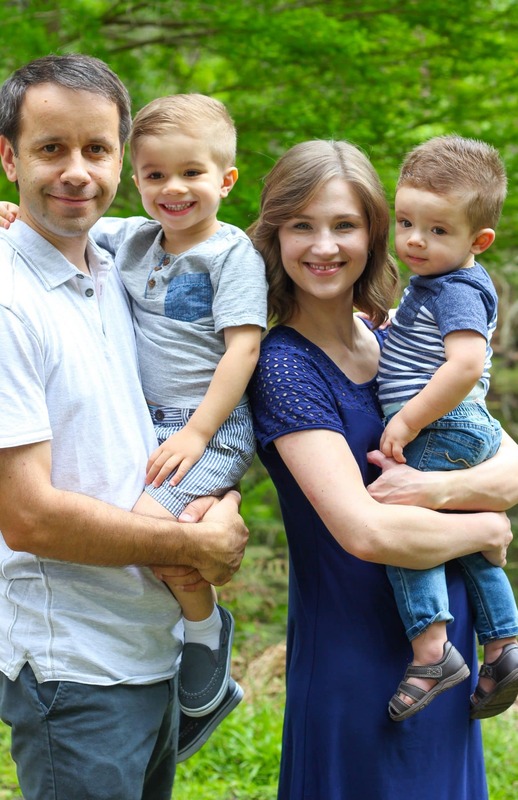 God bless your family! When you say heavy cream . Is that heavy whipping cream? I always wanted to try making this cake but its a little frightening with the amount of steps, esp the pastry cream part. I was thinking of making it for my father in laws birthday but his birthday is in a day. Or maybe ill try it for Thanksgiving. This is definitely a cake for more experienced bakers and/or special occasions, but I think it’s completely worth it. Of course, that is highly subjective:). I hope you do try it, Olga. I am trying it out for Thanksgiving. Already have the pastry cream and dough in the fridge, ready to bake and put together tommorow. Absolutely delicious and the best recipe ever! 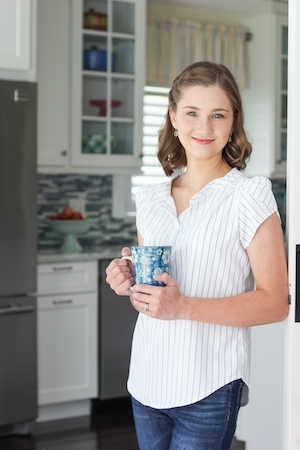 So easy to make and it’s worth it! Thank you! I am so glad that you enjoyed the cake, Ana! I am planning on making this cake for my daughter one year old birthday party and wanted to know if I can make dough using a 9+13 baking pan? Made this for Thanksgiving and it wasn’t as good as I expected it to be. It was to dry. Is that normal?The cream was dry. Even if it stood in room temperature for a while. Def wont go thru all that work to make another one. That’s great, Emma:). I’m so happy you enjoyed the cake. Thank you so much for taking the time to write. I have found that when frosting cakes, you need to use more frosting than you think you do, and giving more time for the cake to soak in all the frosting makes a huge difference:). 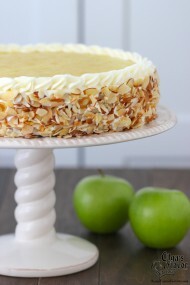 Another tip is to bring the cake to room temperature for at least 30 minutes before serving it. I’m sorry you weren’t happy with the results. Did you use all the frosting? Usually when I use all the frosting, it gets nice and soft, but if you aren’t very generous with it, it will be dry. The cake needs as much of it to soak into the cake as possible. Also, how long did you let the cake stand before serving it? I don’t mean bringing it to room temperature, but how much time after frosting passed before you served it. For this cake, it’s important to give it at least 24 hours before serving it, so the frosting softens the cake layers perfectly. Hi, Olga. I absolutely love your recipe. It is so so good. I do not know if you can help me with my little trouble I ran into while doing this cake. For some reason I’m not able to incorporate all pastry into butter cream. I tried it twice but butter mixture starts to flake off. I do not know if that’s just the brands of butter that I use or what. I used Kroger Brand first time and Tillamook second time. But still I was only able to incorporate half of pastry cream. Even though I had troubles It turned out so delicious. I love it so much. 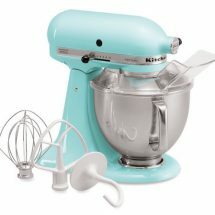 Was just wondering if you could give me any advice on incorporating pastry cream into butter cream. That happens when the butter or the pastry is too cold. They should both be at room temperature. If either are on the cooler side, the butter will become cold and create little “flakes”. I hope that helps, Natalya. 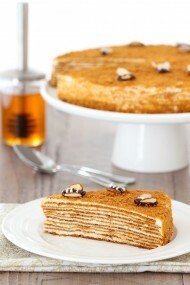 Use the ingredients that I have listed in the Napoleon Cake recipe and the process from the pastry cream. It’s the exact same process and I didn’t want to repeat it and make the blog post even longer. The ingredients you need are the ones listed in this recipe for the cake. 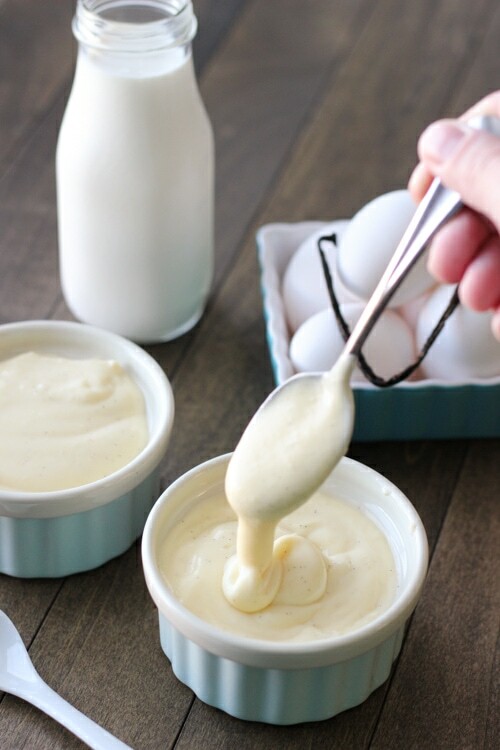 Totally lost on how to make pastry cream. Ingredients are so different that I can’t connect to the instructions. 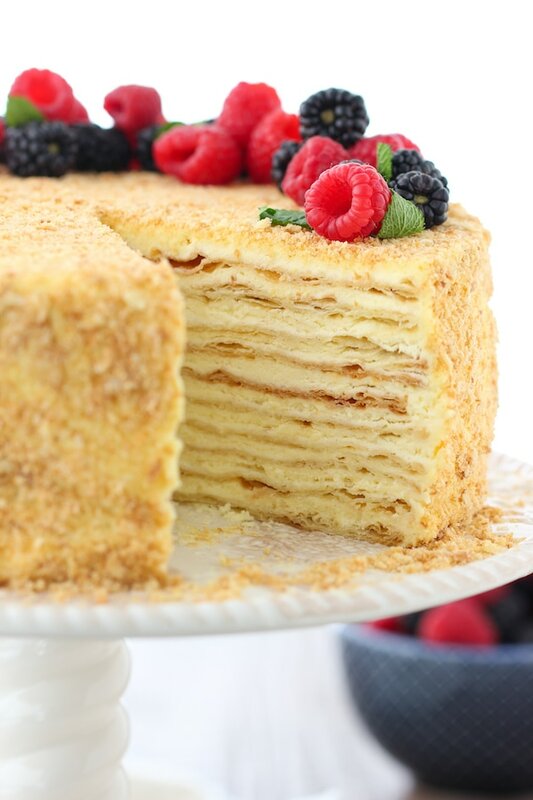 Use the ingredients that I have listed in the Napoleon Cake recipe and the process from the Pastry Cream recipe. It’s the exact same process and I didn’t want to repeat it and make the blog post even longer. The ingredients you need are the ones listed in this recipe for the cake. This is an amazing cake. I was surprised how really easy to make this cake. At first it took me some time to figure it out. This is a keeper. Thank you Olga. I’m so glad you enjoyed the cake, Luda:). How long can I store already baked dough? I would probably say up to 2 days, Jennifer. When i assembled the cake it looked just like yours, tall and beautiful round. Surprisely next day it wasn’t so tall anymore and not evenly round. Do you know why? Could be layers to thin? It is normal for a frosted cake to shrink a bit over time as the frosting soaks into the cake layers. It won’t shrink significantly and it should still be evenly round. The layers could not be too thin. As the frosting seeps into the cake layers, the cake becomes more tender, so that is a good thing.